BentoLunch.net - What's for lunch at our house: More Fun with Christmas Bentos! 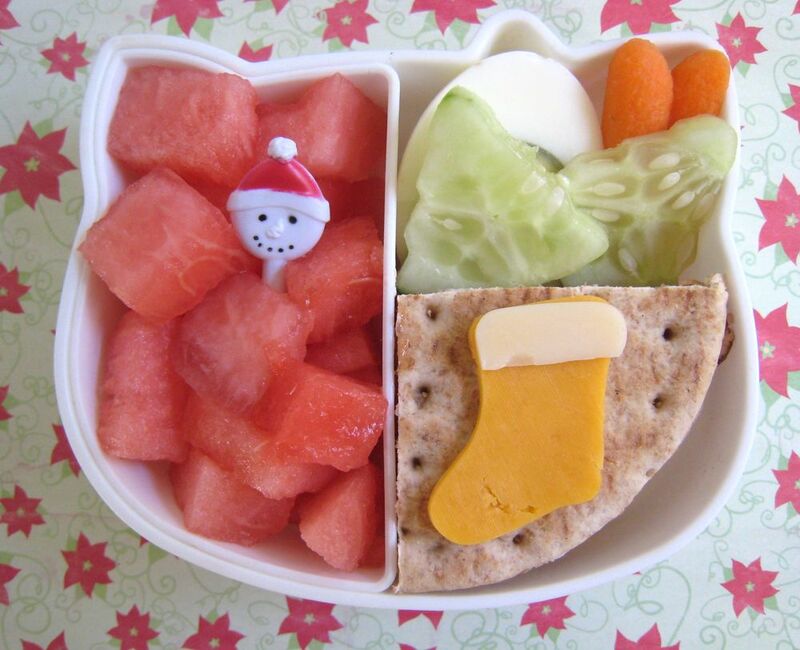 More Fun with Christmas Bentos! Of course, if I had a bit more food in the house, I'd probably be having a lot more fun designing Christmas items. We're finishing out what's currently in the fridge, which means a lot of duplicates and a little less creative. However, we're about done with that, so it's time to grocery shop for something more fun to bento with! In this instance, Faith has lots of watermelon from our garden, a cream cheese & jelly sandwich topped with a cute little Christmas stocking (orange cheddar and Swiss cheese),half a boiled egg, some carrots and Christmas tree shaped cucumber! More festivities to come, I'm sure. F&B already set up all of our assorted nativity collections as well as their mini trees. I just need my big tree up, as soon as we get a new pre-lit one (no one likes putting on the lights around here). Looks so cute and delicious! I have such a hard time getting in to Christmas until Kidlet's birthday is over, we're in full bday mania mode right now! I just found your blog and it's great. But I have to ask- what happens to the leftover part of the cheese or veggie you cut into a shape? Do you throw it out? Nibble as you make the bento? Have your own bento lunch full of odd leftover shapes?